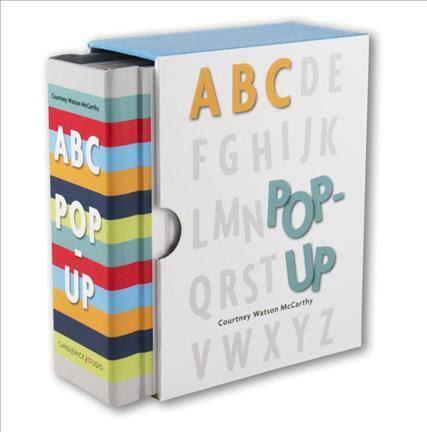 ABC Pop-Up is not like other alphabet pop-up books. It’s a special kind of book that will wow and excite, and it’s for adults as much as it is for kids. Courtney Watson McCarthy has designed a series of stunningly intricate paper pop-ups of recognisable objects that jump off the page. And this is important, because ABC Pop-Up is a wordless picture book. Open the first page and out pops a beautiful round red apple. On the next page a book pops up and on the next page a cat and dog play. This fabulously interactive book asks the reader to guess what object has been presented for each letter in the alphabet, and sometimes there is more than one to a page (just to keep you guessing). There are clues. Throughout the book, on each object, its first letter hides somewhere for you to find. They don’t stand out, and some are tricky to find (I missed the letter L until the third read-through), but the joy this adds to the book is just glorious. A book I was at first scared to share with my three-year-old (for fear of torn pages), turned into a magical moment of togetherness as she shouted out the objects she saw and we searched for the hidden letters together. It is a book that very young hands might need to stay away from, but with supervision this is definitely a book to be shared with pre-schoolers and up. Plus it's a fantastic interactive and fun tool for learning the alphabet. And the pop-ups are exquisite. Delicate, intricate and beautifully designed, they are somewhat addictive, and I found myself wanting to open the book again and again. A special alphabet pop-up book to be shared and enjoyed together, ABC Pop-Up would make a lovely gift for a child learning the alphabet or for anyone, young or older, who loves beautifully designed paper things.